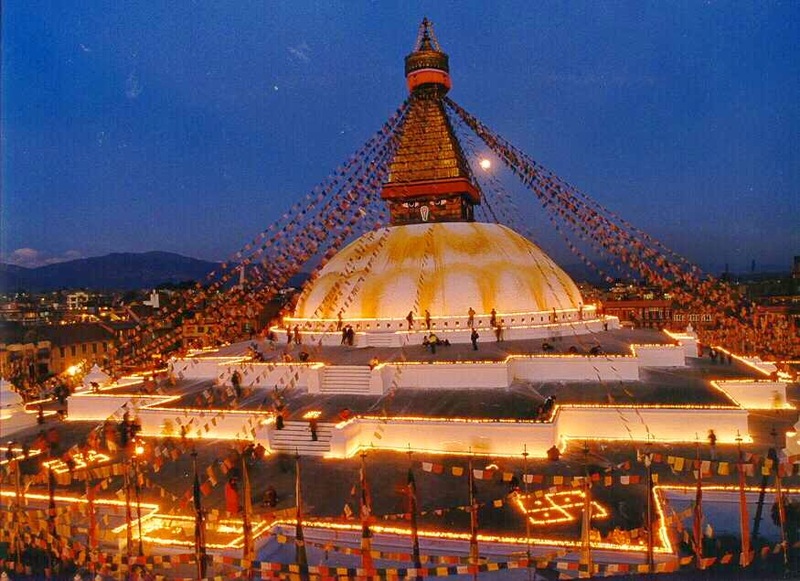 If you are planning to visit Nepal, we suggest you to visit Boudhanath stupa. Boudhanath stupa is also listed in a world heritage site. This site is also listed on the top attraction on the TripAdvisor and lonely planet. We would like you to describe how it is like visiting boudha today. When you make a entrance at Boudha you can see many people visiting here including many tourists, monks, lamas and nuns on their Sharon dress and Mane on their hands. Buddhist monks and nuns moves around along with the meditation and prayers chanting of Om mane padme hum together with rotating manes on the wall or some might rotate their handy small mane. This place looks gorgeous with the huge white stupa on the middle. with peace or buddha eyes painted over it and the crown on the top. Lots of colorful prayer flags are hanged from top of the boudhanath stupa to the bottom of stupa, makes a very peaceful and pleasant sounds with the breeze. You are allowed to climb up to the stupa for one layer but you should check the not allowed areas. Many peoples seems enjoying taking photos of the stupa and themselves in the beautiful background. The surroundings of the stupa is also beautiful with shops and stores selling different items such as incent sticks, clothes, thankas, mandalas, statue and other symbols of Buddha and Buddhism, foods and other stuffs. You can also find bunch of fancy restaurants around the stupa offering local to world wide cuisines. The near by areas of boudhanath stupa has also lots of other monasteries, stupas and gumbas with tlots of buddhism learning centers and local shops. These area is also a residence of lamas, monks, nuns and religious Buddhist populations. Buddhism looks completely in the environment with the incent smells, chanting of lamas and Tibetan and Nepalese music of Buddhism. Do not disturb or stand on the way of the monks, nun and lamas.